As Spring softly passes into Summer, I find myself reflecting on the beauty that this time of year holds; whether it’s the long evenings spent outside or the way the sun streams through the windows in the early morning. Already, the smell of freshly cut grass has got my mind racing about the number of activities we can plan for the children in our villages. Last summer the sun didn’t seem to stop shining which gave us the opportunity to have numerous family Football and Rounders days, on Broadwell village green. It was so much fun and at times I’m sure the parents were even more competitive than your average Canadian ice hockey team. This year I am hoping for many more summer sports days, with the hope of involving even more families, especially as Broadwell now has its very own family football team, the fabulous Broadwell Foxes. We have children and parents that join in a kickabout, every Sunday. At the moment we have around 25 enthusiastic and committed players of all ages - everyone is welcome, so please get in touch if your children would like to come along. To get the ball rolling in regard to this year’s summer activities, Helkias and I are going to be running a half term holiday club in Bledington Primary school on the 29th, 30th and 31st of May (9.30am – 12.30pm), for primary school aged children (all years welcome). The theme of each day will be based on the story of Jonah and the whale. There will be plenty of exciting arts and craft activities to help bring the story to life, as well as a relaxed football or rounders session to end the day. Please contact me if you would like to find out more information or to book a place for your child. If you would like to keep updated with upcoming events and activities for young people, please see our Benefice Website or message me and I can add you to the youth work whatsapp group. 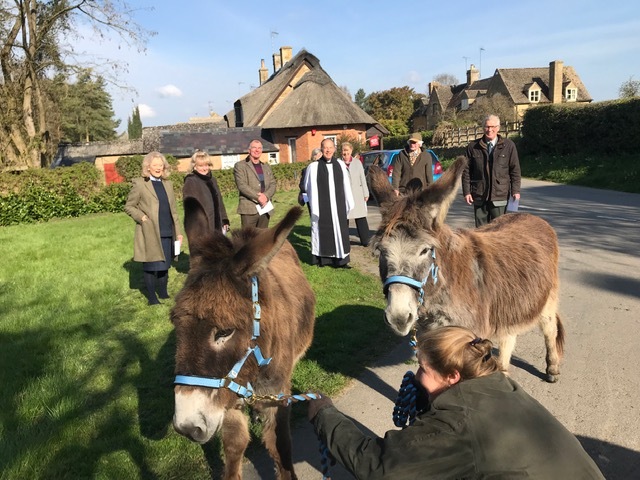 The Church Service at Adlestrop on Palm Sunday was livened up by two, very well behaved donkeys, which led the procession from the Village Hall to St Mary Magdalene Church. Reflection is a key ingredient in our growth and development. The ability to reflect on what's happening around us, and how our decisions and actions affect ourselves and others, is essential if we are to grow into rounded and effective individuals. I've been working for about five years with prisoners at a high-security jail, a place for those we might rather forget - those found guilty of the most serious of crimes. It has been a privilege to walk with these men and see how, for some, a growing reflection on their own shortcomings and misdeeds can build solid foundations for future rehabilitation. For a rather longer time I've been part of the NHS England GP appraisals team - conducting annual professional appraisals for our local GPs. It's been a contrasting but equally fascinating exercise helping these highly-respected members of our society, on whom we place our trust, to reflect and grow in their professional practice and skills. But each of us needs to reflect, if we are to grow, regardless of age or status. For Christians, Lent is a traditional time to do just that. As the newest member of the clergy team here in the Evenlode vale, I'm looking forward to being part of one of no less than NINE different Lent activities across our villages in March & April - times to reflect and ponder on who we are and why we're here. If you've never done a Lent course before - why not give one a try? No prior knowledge necessary, no commitment required. Just pick up a leaflet from church or check the notice board, and come along to one that takes your fancy. And find a new space for reflection. LENT is a great time to take a pause and think about matters of faith and belief, whether you are an established Christian, new to the faith, or just wanting to ’take a peek’ at who Jesus is, and what faith in Him is all about. So this year we’re running a series of Lent courses and events right across the Benefice. You’re welcome to come to any event, in your village or elsewhere—you can just turn up. And each event will be self-contained so you don’t have to commit to the whole series. We hope to see you soon! After the euphoria of Christmas comes the inevitable dysphoria of January. Apparently the utter nadir is Blue Monday which is the third Monday of January, when the combination of Christmas debt, broken New Year resolutions, low motivation and the cold weather coincide to make for the perfect mood buster. I certainly felt the same as I stepped off the aeroplane to a cloudy and cold Heathrow Terminal 2 after having spent nearly three weeks in sunny Zambia. We had a good holiday. We had such hot weather that three of our sons got sunburnt to varying degrees. We ate fresh fish from Lake Kariba. We met my sisters whom I hadn't seen for some time. We saw wildlife that is unique to Zambia. So, as we landed, all these experiences suddenly seemed like they had happened a lifetime ago. It was an unpleasant jolt to my system to go from Lusaka to Heathrow in a matter of hours. And it wasn't even Blue Monday yet. To my chastisement, I remembered how last winter, I had encouraged parishioners at Silver Service to be thankful even for British weather and not be quick to complain. As hard as it is to believe, the weather that we get is a gift from God. For all things comes from him. As bad as the weather is, Heathrow certainly wasn't submerged under the Indonesian tsunami. But more than the gifts of this world, Jesus Christ, the gift of Christmas is not just for Christmas. He was given as a gift to the world at Christmas but to be enjoyed all year round. So, may you (and I) find the true joy of Christmas that is not just for Christmas. The joy that comes from receiving the eternal salvation of God by faith in Christ. May you have God's joy on Blue Monday and every other Monday.